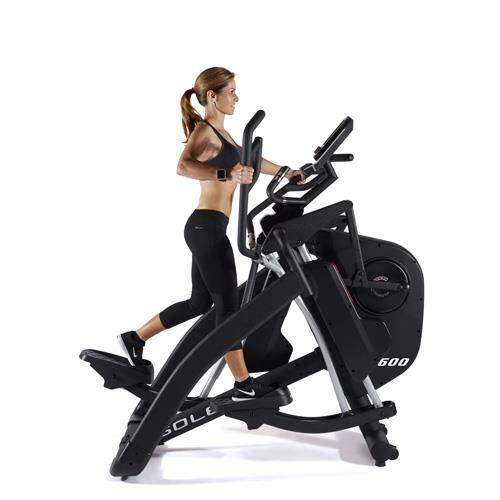 The Sole ST600 Strider is a hybrid training machine designed for residential use. An upgraded version of the ST300, the machine comes with a heavier flywheel, increased user weight capacity, power adjustable stride, and a longer warranty. The ST600 has a 7.5” backlit LCD console that displays time, distance, calories burned, watts, RPM, pulse, and speed. It is preloaded with 12 workout programs designed by professional fitness trainers. Warranty – Lifetime on frame, five years on parts/electronics, two years on labor. UPDATE: Sole has discontinued their ST600 and ST300 Striders. For a comparable elliptical check out the NordicTrack FreeStride Trainer FS7i. It's one of the top selling trainers on the market, and has a lot more features and capabilities than the ST300 and ST600 offer. The first thing you notice about the ST600 is its footprint. It has a smaller footprint than many other ellipticals and striders on the market today, including its little bro – the ST300. The compact size means it requires very little storage space and is an ideal choice for those who live in small apartments where space is a constraint. The ST600 allows you to adjust the stride length from 18” to all the way up to 26”. Whether you are short, tall, or of average height, you can find your natural stride and work out comfortably. It also makes it easier for multiple individuals to use the same machine, as each can adjust the stride length to their convenience. One feature that comes up in reviews that users seem to be happy about is the power adjustable stride. Critics have also noted that it is a much-needed upgrade from the ST300’s manually adjustable stride. You no longer have to reach for the lever every time you want to change your stride length. It can be done at the touch of a button. The lack of a lever is also the reason why the ST600 has a smaller footprint than the ST300. Like the ST300, the ST600 can also be used as a stepper, elliptical, and a treadmill, depending on your preference. You can adjust the stride length to fit your natural stride and use it like an elliptical. You can shorten or lengthen your stride to use it like a stepper or a treadmill respectively. You can grab the multi-point handlebars for a total body workout and get faster results as well. One thing that many user reviews have pointed out is that the ST600 is very easy on the joints. 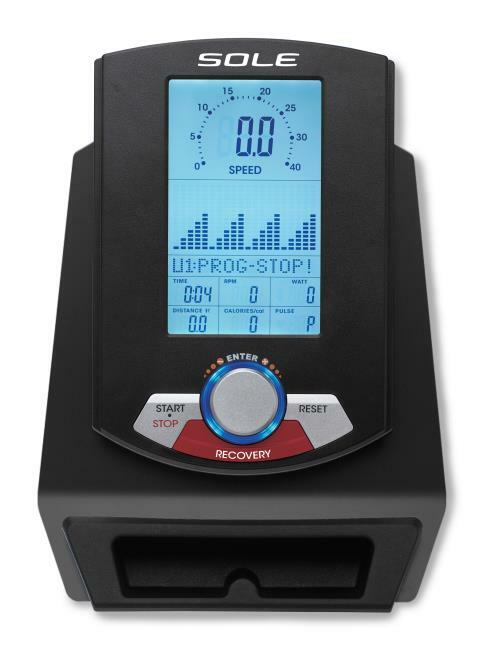 If you have ever worked out on a stepper, you will notice the difference the moment you start working out on this machine. You can easily mimic the up-down motion of the stepper without your joints taking a pounding. Similarly, jogging or running on a treadmill can also place a lot of strain on your joints. It can be particularly bad for those who suffer from knee problems. With the ST600 Strider, you can take long strides and run like you would on a treadmill without straining your joints. The combination of a heavy flywheel and the ECB system means the shift from one resistance level to another is smooth, silent, and efficient. There are 16 levels of resistance – you can start at the lower levels and climb your way up to burn more calories and get faster results. The cushioned foot pedals are large enough to fit your feet comfortably. Another thing that many users have pointed out in their reviews is that the pedals are positioned very close to each other to emulate natural, real-world walking, jogging, and running movements. The machine weighs 288 lbs and is a lot heavier than the ST300. It is also solidly built with high-quality components. It looks and feels like the light-commercial machines you find in fitness clubs. There are a set of transport wheels that allow you to move the machine around easily. While the ST600 is clearly better than the base model, it still lacks a few features. The lack of Bluetooth connectivity is a glaring downside. However, the entry of newer models from Sole Fitness with Bluetooth technology is welcome news, which means the ST300 and 600 too could be upgraded in the future. 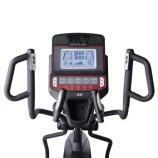 The machine has grip sensors in the handlebars and has a wireless heart rate receiver, but the chest strap is not included with the package. It is really disappointing, especially given the machine’s price tag. The lack of a hi-tech console is another thing that needs to be pointed out, given the fact that many other manufacturers offer a full-color, web-enabled touchscreen at this price point. A case in point is the FreeStride trainers from NordicTrack. So, we hope to see a console upgrade in the future as well. The ST600 is a quality hybrid training machine designed for highly effective total body workouts. You can use it as a stepper, elliptical, and a treadmill to infuse some variety into your workout routine. Solid and durable, the machine will last a lifetime if maintained properly. So, with the ST600 Strider, you are definitely getting your money’s worth. The lack of Bluetooth connectivity is the only real downside, which we hope will soon be fixed. The lack of bells and whistles is also an issue, especially when compared to other machines in its class, but you cannot hold it against the ST600, as it outclasses its competition in so many other areas. On the whole, the ST600 Strider is a great buy, especially if you can get it at a discount.